It’s okay, Mr. Murdoch. We think we finally understand why you hate Google and the Net so much–you gave it away in your rant during News Corp.’s finances: It’s because you really don’t get technology–or people–very much. I’m referencing a little aside the news industry billionaire made during a conference call about News Corporation’s second quarter earnings yesterday. 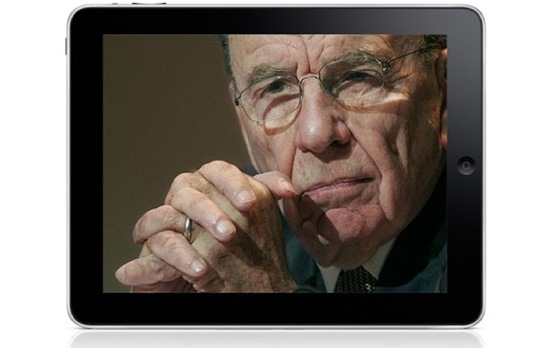 On the subject of tablet PCs (clearly driven by all the news of Apple’s iPad,) e-readers and smartphones, Murdoch admitted these devices were a growing phenomenon. What you’re referring to, Rupert, is, of course, your content: That’s what you think we should be viewing on these devices. “Undercover” reports on what it’s like to visit the country’s first legal male prostitute and such. That’s what we should be paying you for the privilege of accessing. That’s what you mean enervates these machines. But you’re wrong. E-readers are a slightly different thing, but smartphones and tablets are brought to life by content of a completely different sort: Social networking, games and interactive media straight from the Internet, like YouTube. It’s about emergent, dynamic ways of interacting, creating new ways to engage with other people. It’s Twitter’s powerful life-streaming statuses, Facebook with its hundreds of millions of chatty users, MSN with its hoard of teenage addicts and the social-net leaderboards of games on smartphones that bring these things to life. Their users interact in real time with other people dotted around the globe–and the revolutionary bit is that this is done on a truly portable basis for the first time. “Dead” one-way transmitted content, which is mostly what Murdoch’s business creates, just pours into these devices in a single direction. And people do indeed listen to music, read books and newspapers, and watch movies on them. But by implying Apple’s iPad (and other tablets) are lifeless without this sort of material, Murdoch is trying to suggest that the old-fashioned broadcast system is still King, and that it drives the consumer experience on portable gizmos. He’s ignoring that Web 2.0 has been with us for some years now, and that people the world over are generating their own entertainment and news content via these devices–sometimes even beating the news giants at their own game, particularly in the case of Twitter. And this sort of dynamic, exciting interactivity is actually being enabled and accelerated by these new classes of always-connected, powerful pocket computers. When I go overseas, and switch off my iPhone’s data roaming powers lest I rack up a large roaming bill (thanks, Vodafone!) it’s all this sort of interactive data I miss from my doodlings with the phone…even mundane stuff like checking the weather forecast for my geo-located position. It’s only then that I have to fall back on the stored video and texts in my iPhone to get me through a boring flight or train journey–the kind of content Mr. Murdoch thinks is “emperor” of the online world. Murdoch would clearly prefer us all to be dumb, paying consumers of his wonderful broadcast content, rather than dynamic, interactive, opinionated living creatures who generate and evaluate content all by ourselves. And he’s obviously not aware that tens of millions of iPhones have already sold, and that tens of millions of iPads (along with all the subsequent copycat smartphones and slate PCs) will sell too, all without an emphasis on News Corp. products. And now, rant completed, I’m off to gaudy-up my MySpace page with nonsense and then believe every single word in a Fox News report. [Via ZDNet] To learn more follow me, Kit Eaton, on Twitter.